Sophie’s dolls (some of which were my dolls, when I was little) eat their meals in the same highchair my dolls used when I was little. Katy and I shared the highchair, as well as a doll crib. It’s seen some great wear, but still, Sophie was thrilled to receive it (Colleen has the crib). One boring, cold, rainy Saturday afternoon, while the boys were sleeping and Andy was away, I decided we should paint it. Sophie wanted it to be pink, of course, which was easy because we had leftover pink paint from painting her bedroom walls. And yes, I opened the paint can with a chisel. And yes, I stirred it with a broken mini-blind rod, which I found in a pile in the basement. But putting off cleaning the basement is easy to do. Especially with three small children. However, the frustration I felt trying to find a paint can opener, stirrer and brush in our throw-it-down-the-steps-and-deal-with-it-later basement put me into a full-blown tizzy. Operation Clean Basement is underway. Back to the highchair. It’s amazing what a couple coats of paint can do. Sophie loved the project. Sure she missed a bunch of spots, and at times she applied the paint too thickly and too evenly (I did, too). 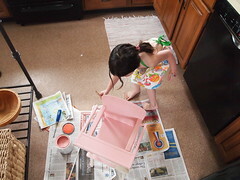 Paint got on the kitchen floor (despite the newspaper) the bottom of her feet (and mine), on my elbow and in her hair. But given that I’m a terrible painter, I loved having her help me. Because no matter how it turned out (and honestly, it turned out surprisingly OK), I could say “Sophie helped me!” when anyone commented on the paint job. 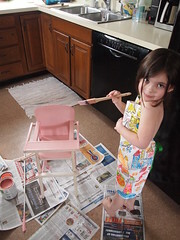 This entry was written by kara, posted on March 3, 2013 at 9:52 pm, filed under All and tagged basement, clean, highchair, Katy, mess, paint, saturday, Sophie, winter. Bookmark the permalink. Follow any comments here with the RSS feed for this post. Post a comment or leave a trackback: Trackback URL.